“Light induces photoreactions that activate the switch of the magnetic orientation of 2D materials dispersed in water. A way to use light to induce changes in the optical and magnetic properties of water-dispersed titanate nanosheets has been devised by RIKEN researchers1. This opens up opportunities for using liquid crystals based on two-dimensional (2D) materials in smart optical devices. The properties of liquid crystals lie somewhere between those of solids and liquids. For example, they can be fluid like a liquid and yet exhibit a molecular order similar to that of solid crystals. The properties of liquid crystals depend both on their composition and the orientations of the molecules that make up the crystals. The molecular orientation can be altered by varying the temperature or applying light or a magnetic field—an ability that is exploited in several applications, including displays and sensors. Dispersions of 2D materials such as nanosheets in water behave similarly to liquid crystals. In particular, external stimuli, including electric fields and mechanical forces, can be used to tune the orientation of the nanosheets. However, such stimuli can also damage the nanosheets. Magnetic fields offer a gentler stimulus that preserves the material integrity. But it is not known what effect combining magnetic fields with other inputs will have. 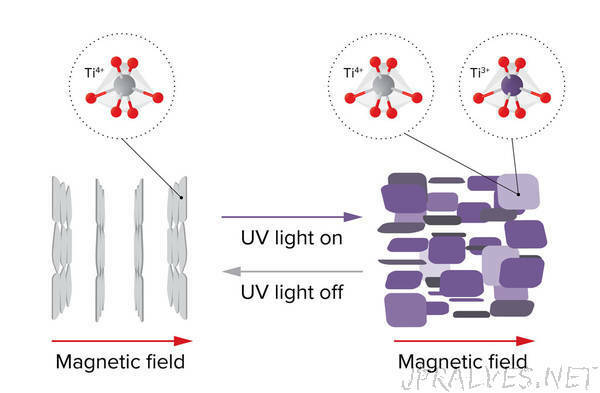 Now, the team led by Yasuhiro Ishida and Takuzo Aida from the RIKEN Center for Emergent Matter Science have investigated the combined effect of light and magnetic field on the orientations of titanate nanosheets dispersed in water. When exposed to a magnetic field, the nanosheets oriented their planes perpendicular to the magnetic field. This behavior is a result of the intrinsic magnetic properties of the titanate nanosheets, which are often difficult to manipulate. When the aqueous dispersion was irradiated with ultraviolet light, it changed color to purple and the nanosheets oriented their planes parallel to the magnetic field, becoming paramagnetic (Fig. 1). This color change indicated that the ultraviolet light had chemically reduced the titanate nanosheets. This and the consequent change in magnetic properties were reversed when the light was switched off.